Antique Gold Thread Cutter Pendant  - $7.96 : Yarn Tree, Your wholesale source for cross stitch supplies. Item 3104. Antique Gold Thread Cutter Pendant. 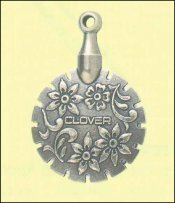 This charming pendant is designed with a sharp circular blade inside so threads can be cut using any of the grooves. Approx 1¼” diameter. Perfect for attaching to any of the Yarn Tree Accessory Necklaces! From Clover Needlecraft.